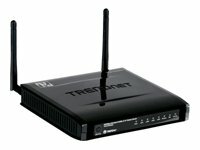 TRENDnet 300Mbps Wireless N ADSL2/2+ Modem Router TEW-635BRM (Black) by TRENDnet at AABX. SKU: TEW639GR. MPN: TEW-635BRM. Hurry! Limited time offer. Offer valid only while supplies last.